An exceptional perfume designed for an exceptional woman, L’ACQUAROSSA could only be packaged in a precious, luxurious and one-of-a-kind object. The fusion of these two ambitions results in an ancient treasure with the design of today. Its angular and monumental geometry recalls the perfect, mathematical, and majestic architecture of Roman monuments, revisited with spare contemporary lines. Its colour functions like a colour block in a passionate and devouring red. Lacquered to perfection, it is polished, gleaming, cosmetic and impeccable. While in passing it dances in three-step to its black and gold cap in echo of the clasp on the iconic Fendi Peekaboo bag. A stunning woman and a pervasive trail of scents. This is the obvious balance for a perfume that does not go unnoticed, for a woman who does not shy away from attention. 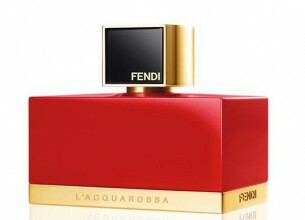 A declaration of ultra-femininity, a manifesto for hyper-sophistication, L’ACQUAROSSA leaves behind a tenacious trace. This trail is created by a Floral Woody accord, both flamboyant and alluring. Front stage, an explosive and vivacious top note, so very Italian and simply sublime. The notes of Bergamot from Calabria and Tangerine from Sicily are rounded with a delicious Plum accord that is sparkling, elegant and intoxicating. The heart of the perfume throbs with the scents of the Lantana Flower. This red and gold flower has all the temperament of the Mediterranean regions where it blossoms: wild and untameable, it exudes fruity, spicy and acidulous accents. But it is willingly enhanced by a noble bouquet of essence of Rose, Orange Blossom and Magnolia. Backstage, the essence of Red Cedar, Musk and Patchouli from Indonesia confirm a powerfully feminine and highly sophisticated composition with every single note it exudes. In the final score, a rich trail is engraved in marble – like the Roman splendours inspiring it. Availability: Edgars, Red Square, Truworths, Stuttafords and Foschini.